(HOPE, B.C.) These two Ladies of the Canyon are willing to go beyond Hope to connect with the past and get a glimpse of the future. 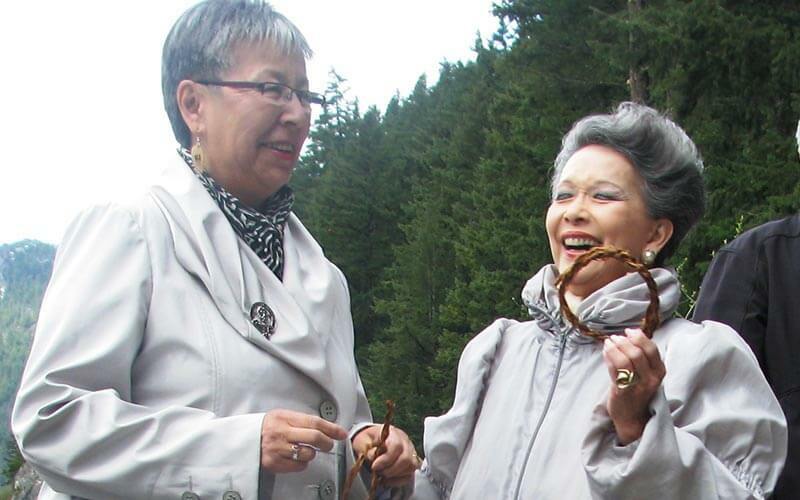 Senator Vivienne Poy and Senator Dr. Lillian Quan Dyck will tour the historic Fraser Canyon, participate in the Grand Opening of the Tikwalus Trail and attend a community presentation of the Alexandra Bridge Project in Hope, April 19-21. Senators Poy and Dyck are prominent members of the Chinese-Canadian community. Senator Poy — an author, entrepreneur, fashion designer, and historian — is from Toronto and was the first Canadian of Asian descent to be appointed to the Senate of Canada. Dr. Lillian Eva Quan Dyck is a member of the Gordon First Nation in Saskatchewan and a first generation Chinese Canadian. She is the first female First Nations senator and first Canadian born Chinese senator. They’ll be touring the historic Fraser Canyon as guests of the New Pathways to Gold Society (NPTGS) a community-based organization dedicated to multiculturalism, First Nations reconciliation and heritage tourism development. “We are honoured to have two such distinguished women as our guests,” said NPTGS Co-chair Terry Raymond. Senators Poy and Dyck will see firsthand the efforts of local communities, First Nations, heritage organizations and businesses to celebrate the rich Chinese-Canadian and Aboriginal heritage in Fraser Canyon, part of the Gold Rush/Spirit Trail between Hope and Barkerville. The Senators (as well as representatives from NPTGS and local officials) will speak and be available to answer questions at the Tikwalus Trail Grand Opening ceremony. “The New Pathways to Gold Society has the scope of vision in bringing forth the beauty and the history of the Fraser Canyon, encompassing the past and the future, capturing the lives of the First Nations people, the fur trade, the gold rush and the building of the CPR to the present prosperity of British Columbia,” said Senator Poy. And Senator Dyck said she’s excited at the prospect of experiencing some of the Canyon’s the multicultural history. “I am looking forward to learning about the interwoven stories of the First Nations peoples, the British, the Chinese and others who were part of the fur trade and the gold rush eras,” said Senator Dyck. Both Senators will attend the Grand Opening of the Tikwalus Trail will take place at 1:30 p.m. on April 20, 2012, in the traditional territory of the Spuzzum First Nation. This joint project of the New Pathways to Gold Society, Spuzzum First Nation and Hope Mountain Centre restores a 12.7-kilometre-long loop on the eastern side of Alexandra Bridge Provincial Park, with the trailhead near Alexandra Lodge. The event marks an important milestone in efforts to restore the Alexandra Bridge Provincial Park area and make it a world-class heritage tourism attraction. On April 19 at 8:00 p.m. at the Hope Recreation Centre, the Senators will take part in a public presentation/community consultation session on the Alexandra Bridge Project will be staged by the project lead partners (the New Pathways to Gold Society, Hope Mountain Centre and Spuzzum First Nation). The discussion will center on the restoration of the park and its environs, especially the 1926 Alexandra Bridge structure. “It’s great we’re able to show Senators Poy and Dyck the various heritage sites in the Fraser Canyon, places where the First Nations and the early Chinese worked together and established their relationship,” said NPTGS Director Lily Chow, who was instrumental in getting the Senators to make the visit.